My surgery is tomorrow. Let's be honest, I'm a nervous wreck. I'm anxious for the outcome, however I'm relieved it's almost over. You would think I'd be a pro at waiting, but it still takes a lot of work to remain optimist. It's so easy to give up and be angry at the world. To walk around each and every day in a sad, depressed mood and take it out on everyone around you. I'm reminded constantly that stress has many negative effects on the mind and body. But it takes a lot of work and dedication to NOT stress out. There are different ways to stay occupied and distract you from those negative thoughts. Some people take up a new hobby, try out new recipes, go on vacation, or surround themselves with friends and family. I have mastered the art of distraction during the day, it's late at night when I fall victim to my thoughts. Left unchecked, my mind will concoct worst case scenarios. I believe that being positive and optimistic are helpful ways to eliminate stress. Having a positive outlook on life is important, but it's always good to be prepared for the unexpected. 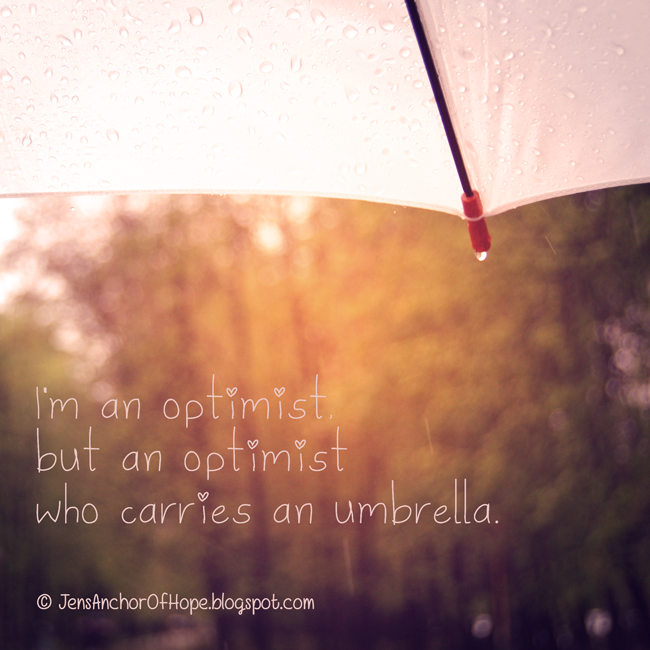 That's why I always carry my umbrella! I'm fully aware of the possible outcomes from my surgery tomorrow, however worrying about them today doesn't do me any good. When I say I chose to be optimist, please don't think I live in a world filled with rainbows and butterflies. I have my bad days and throw myself pity parties. But I refuse to let my wounds turn me into a person I'm not.